Yay! 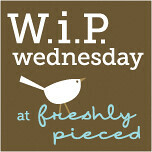 I actually have works in progress to share! I finished this quilt top started for charity a few months ago and haven't shared yet. 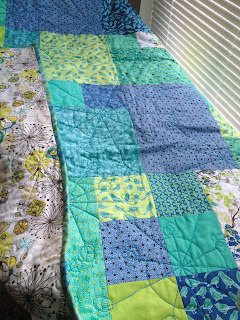 My great finish in the past week was a baby boy quilt for a friend. 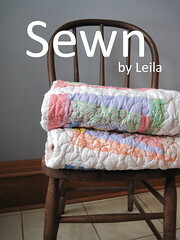 Last week I worked on the quilting and spent our weekend trip to Ohio sewing on the binding. I plan to work on the label today. 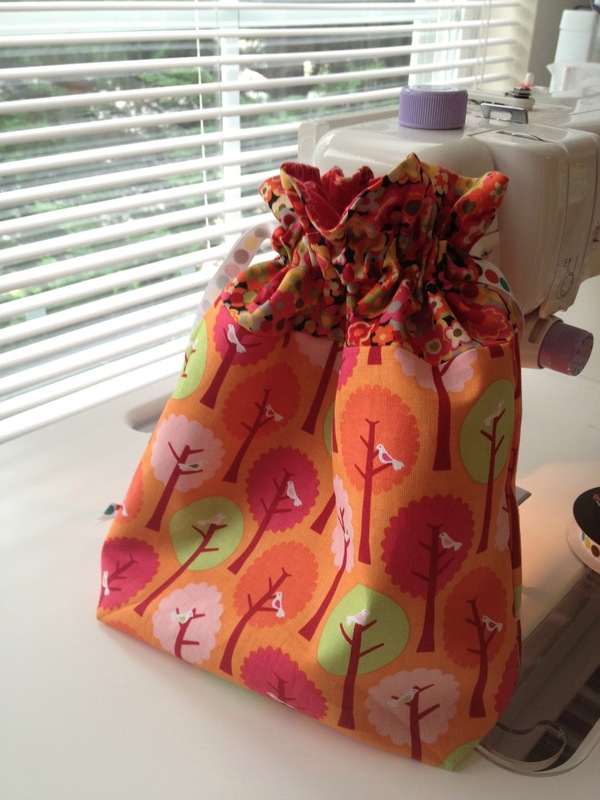 And a lined drawstring bag from an InColorOrder tutorial as practice for the upcoming DC area modern guild swap. I also finally basted the owl quilt using the student tables in my classroom. (Basting is an issue in a tiny apartment...anyone else have this problem? How do you work around it?) 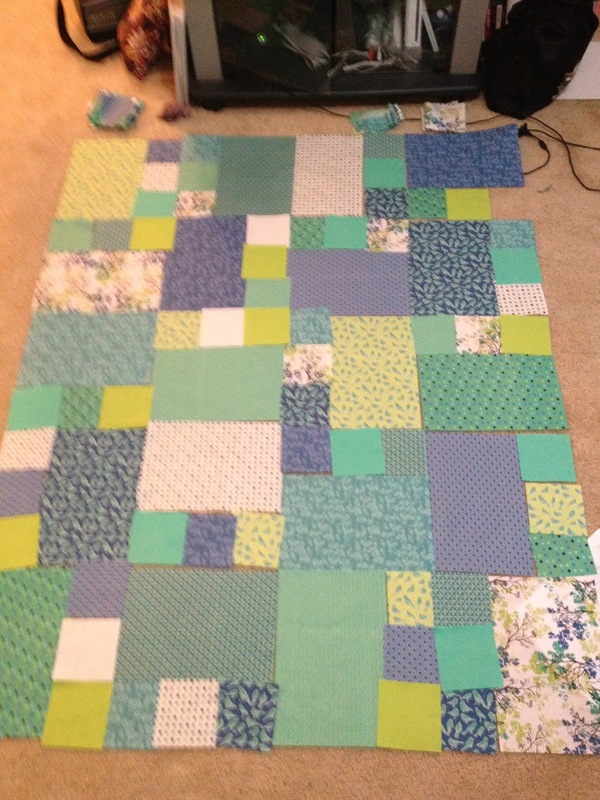 I want to get my FMQ skills back up to snuf, then--let the quilting begin! -Baste and quilt my t-shirt quilt. 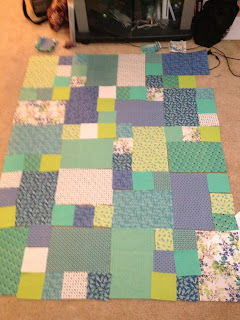 -Practice FMQ with a silly project for my classroom. -Use some fabrics I inherited from John's grandmother to make some of Tula Pink's City Sampler blocks. Now I'm off for a walk/jog before it starts to rain! Oh I love your baby boy quilt! Beautiful! I really like your owl quilt and your quilting on the baby boy quilt! Thanks Karen! I'm looking forward to quilting the owl quilt. Great projects and the fabrics are "to die for" ! Thanks Esther! I just started sewing recently and my stash of fabrics is growing rapidly. They're all so beautiful--how can you choose? The owl quilt has such whimsy and the color palette is precious! Thanks Diane! 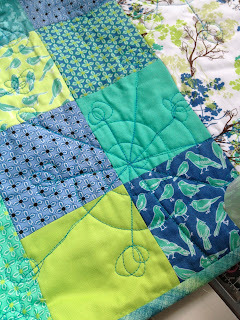 I saw a sample of the quilt at the LQS that sold me my Janome. It was so cute--I couldn't resist! 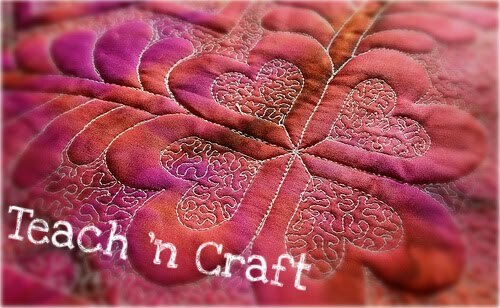 I hope you do give FMQ a try! I'm sure it's not for everyone--but I've loved it so far. It's hard to resist something that lets me doodle in a "useful" way. Thanks for the compliment and for stopping by! Wow! You are really getting some good stuff sewn since school ended. Way to go!